It's that time again! 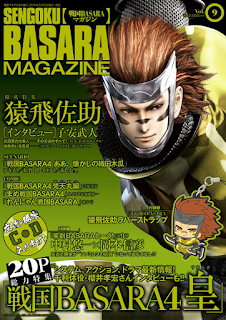 The 2nd July 2015 issue of Weekly Famitsu is now on sale in Japan which means that we have the latest official Sengoku Basara 4 Sumeragi news update. The topics are numbered as usual. 33. The updated Shingen, Toshiie and Matsu tear through the battlefield! The three remaining returning characters are reintroduced with their profiles from Sengoku Basara 4 and the first details of their brand new R2 specials. R2 #1: Ochiru Koto Hoshi No Gotoku ('Fall As A Meteor') - A technique where Shingen releases a dropkick with so much force that it's like a falling star. It can be charged in mid-air to increase the power accordingly. This move can also be useful as a ranged attack. R2 #2: Takeru Koto Tora No Gotoku ('Ferocious As A Tiger') - Time it right and Shingen will release a barrage of attacks. If you succeed in pressing the buttons correctly, Shingen will go straight into his powered-up Fuurinkazan state. Scatter the enemy in style! R2 #1: Saihate He No Touteki ('A Throw To The Farthest Limits') - Toshiie throws his spear with all of his might in this extremely dynamic move. The power of the throw is affected by the timing of the buttonpress. R2 #2: Meshi No Kangeki ('Food Inspiration') - A technique where Toshiie heals himself by eating a pile of rice balls that were given to him by his wife Matsu. Press the button correctly and Toshiie will also be powered up for a short time. R2 #1: Koryuu: Ame No Hoshigumo ('Old Style: Heavenly Nebula') - Matsu moved forwards, spinning her naginata and creating a gigantic tornado. If her animals are around they can join in for a combination attack. R2 #2: Kakero, Shiroumaru ('Advance, Shiroumaru') - A technique where she summons her wolf, Shiroumaru. Once the summoning is complete, Shiroumaru faithfully brings the surrounding enemies to Matsu. Toshiie is wearing a summery recoloured blue outfit with what looks like a floral pattern instead of his usual fur, and Matsu is dressed in a similar pink costume. 34. Collect Tenka Medals by attacking the 'Medal Soldiers'! When you destroy a Roulette Camp, one of the rewards you can get from the roulette wheel landing on 'Tenka' (red) is that Medal Soldiers with stacks of Tenka Medals on their backs will spawn on the map. Predictably, killing these soldiers rewards you with a large number of medals. They will vanish 30 seconds after they first appear. There's another batch of reward descriptions, as usual. Some have already been shown at events. 32 of 167: Masamune's seventh costume, the Pitch Black Dragon King Ver. 33 of 167: A second medal costume for Kojuurou: Tengu Kamen Ver. 34 of 167: Matabee's reddish costume, the Crazy Dinosaur Coloured Ver. - the name is pronounced 'dinosaur' but written with slightly different characters to change the meaning. 35 of 167: Kanbee's Prisoner Outfit Ver. which resembles his Sengoku Basara 3 costume. 36 of 167: A skill enhancement for Toyotomi Hideyoshi. Hideyoshi launches the enemies and pummels them in mid-air. After starting the attack, you can keep pressing the button to increase the number of punches. 37 of 167: A skill enhancement for Takenaka Hanbee. Using his jointed sword like a whip, Hanbee beats the ground. The enemies in front of him lose their will to fight and become defenceless, then they're lashed with a vicious strike. 38 of 167: A skill enhancement for Maeda Toshiie. 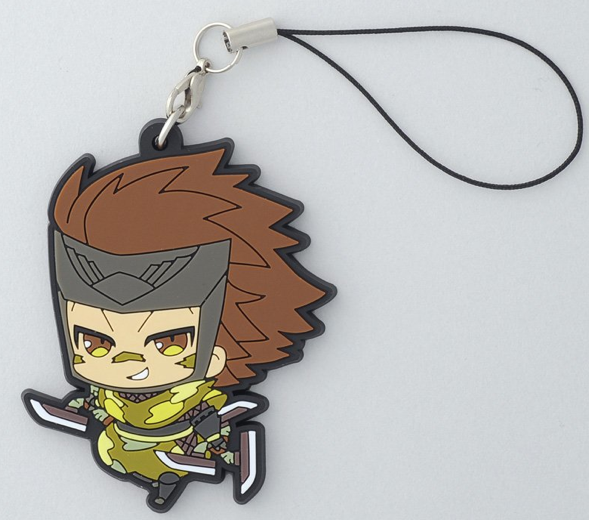 Toshiie shoots fireballs using his spear, scattering the flames over a wide area in front of him. It's possible to power the flames up if you press the button at the right time. 39 of 167: A skill enhancement for Matsu. Matsu charges with her summoned animals, drawing the enemies in before finishing with a slam. This technique can also be used in mid-air. All of the costumes had technically been shown before this time, so I guess it's not as exciting as usual. I'm surprised that Kojuurou got another one, though it means that the Takeda Dojo story costumes now make a complete set. Hideyoshi is wearing a golden/purple outfit in the screenshot showing his move enhancement. 36. Check out the Monster Hunter collaboration DLC costumes! These were all revealed yesterday but we now have more pictures, official names and very short descriptions. Ashikaga Yoshiteru is wearing the Monster Hunter Silver Sol Series Ver. armour (Silver Rathalos in English). It looks a lot better in the bigger picture in the magazine compared to yesterday's tiny preview. Shibata Katsuie's outfit is called the Monster Hunter Reia S Series Ver. (Rathian S in English). He's equipped with the Insect Glaive. Ii Naotora's outfit is the Monster Hunter Kirin Series Ver. and the article writer promises that her exposed thighs and abdomen will increase her sexiness; she can charm all of the guys (Raindrops' note: poor Naotora...). Her blade has been swapped for a Kirin Thundersword. Gotou Matabee is dressed up in the Monster Hunter Dosuranposu Ver., which is apparently a Velocidrome in the English version. The PS3 version of Sengoku Basara 4 Sumeragi has slipped slightly to 23rd place in the magazine's list of upcoming games while the PS4 version is back in 35th place. The game's official website will probably update in a few hours to confirm all of this information and share high quality versions of the pictures. I didn't expect to have much more news to post today after catching up yesterday. I was wrong. Remember Bokesuke, the live action parody version of Sen No Rikyuu's 'third personality' who debuted at the Nico Nico Choukaigi 2015 event? It seems that Capcom have more plans to use him in a series of six videos called Sengoku Basara 4 Sumeragi Bokesuke Special Video: Matsuo of Chocolate Planet's 'Do You Know This, Bokesuke?'. The clips will be released on the official website every Thursday until 23rd July 2015, and three of them will be previewed one day early on Capcom TV on the weeks that the show airs. The first video aired during today's episode of Capcom TV (episode 23) and it was about a novelty ballpoint pen which delivered a small electric shock to the user. The topics for the remaining shows will be gomu pacchin (a rubber-stretching game), headphones, foot massage, Brazilian waxing and death sauce. I doubt these clips will be very interesting to most fans who don't follow Japanese comedy, but please take this as advance warning that the website will update with these goofy videos each week. The CafeReo website added two new lines of merchandise yesterday, both of which merge the anime and game designs. 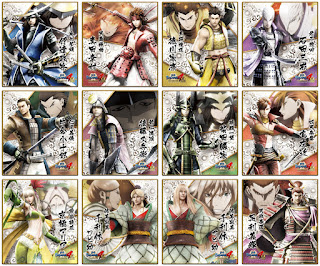 The first is the Sengoku Basara 4 Sumeragi Mini Shikishi Collection, a set of twelve collectible illustrations. They'll be priced at ¥450 each or ¥5,400 for a box of twelve when they go on sale in late August 2015. A rare glimpse of anime-style Matabee! 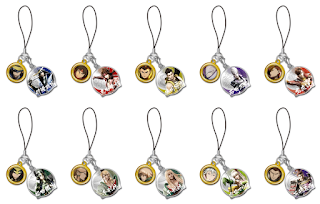 There's also a set of ten different charms in the Sengoku Basara 4 Sumeragi Bushou Metal Strap Collection. The straps are priced at ¥500 each or ¥5,000 for a box of ten. They'll be available in late September 2015. 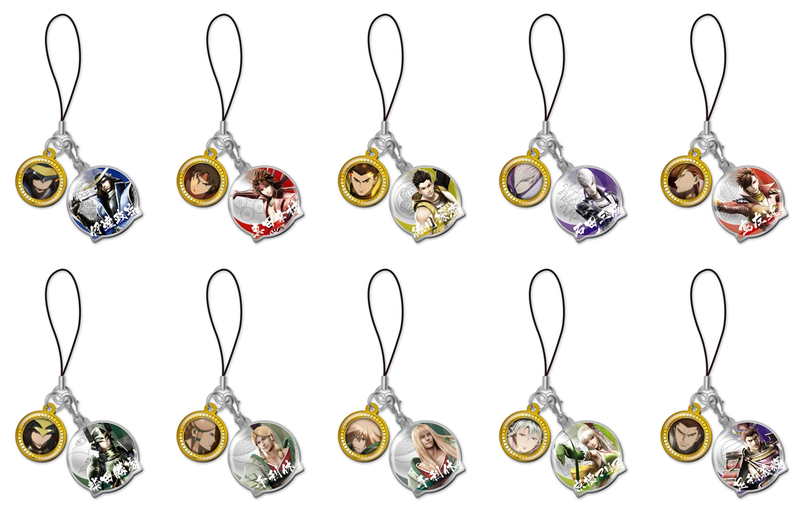 Rather cruelly, matching Kojuurou and Matabee options for the straps don't seem to exist. The Amazon Japan listing for Sengoku Basara Magazine issue 9 (due out at the end of this month) has been updated, giving us a clearer look at some of the content which hasn't yet been announced thanks to their new placeholder image for the magazine's cover. It's possible that the cover illustration will be changed as usual. If it is, I wonder whether we'll see anime-style Sasuke this time or a new CG render? There's also an updated preview shot of the rubber strap and a promise that the Sasuke coverage will span 18 pages. It seems that the two-part 'scenario novel' from the previous issues was a success as there's a new one starting in this issue titled Sengoku Basara 4: Aa, Natsukashii No Oda Mokkou ('Ah, The Good Old Oda Mokkou'). The mokkou (Japanese quince) is the flower famously used on the Oda clan's family crest and Mitsuhide will be the main character this time. The mini-novel will (finally) tell the story of what happened with the Oda army behind the scenes during Sengoku Basara 4, naming Nobunaga, Nouhime, Ranmaru and Katsuie in the list of characters. The game's scenario writer Matsuno Izuru is returning to write the story with Ashika Nozomu providing the illustrations. Ashika has worked on several short Sengoku Basara manga in the past so it sounds as though this will be something to look forward to. In addition, there will be an interview with Sasuke's voice actor Koyasu Takehito and the tribute illustration will be drawn by Mikami Ritsuhiro. It's described as depicting a close-up scene with Sasuke battling Kojuurou. The 'Basara Challenge' skit on the bonus CD has Sakon and Katsuie working at a family restaurant and trying to treat the customers with the appropriate hospitality. Oh, and there will be a full 20-page feature all about Sengoku Basara 4 Sumeragi including an interview with Sakurai Takahiro (Sen No Rikyuu). Most of those pages will probably be spent covering the information we already know, but there's a promise of comments from KobaP and YamamotoD so there should be some interesting tidbits to hunt for there too. "the article writer promises that her exposed thighs and abdomen will increase her sexiness so that she can charm all of the guys"
Neat info all in all, thanks again Raindrops! 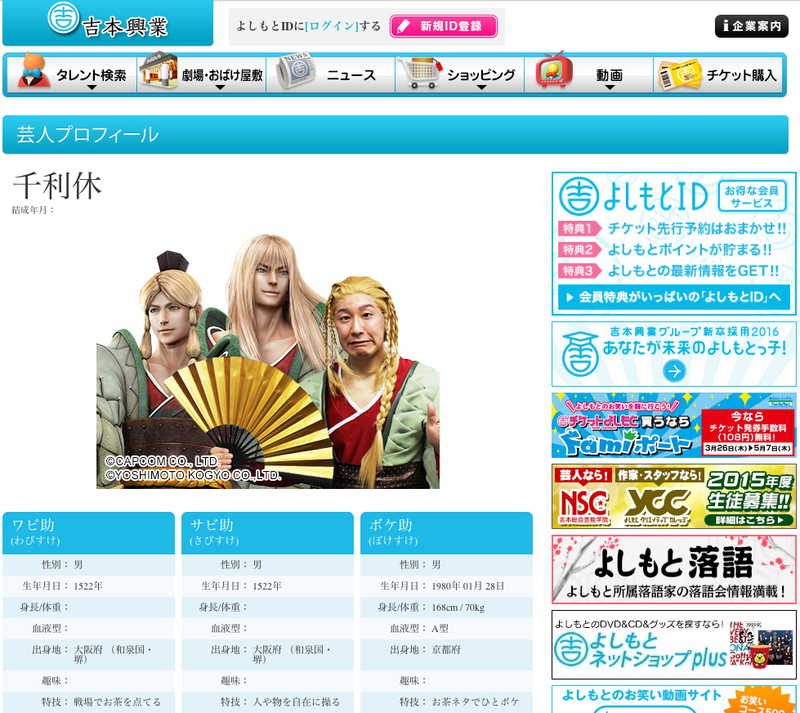 Oh, additionally, glad to see Ranmaru and Nouhime get some focus in side materials. Pretty much assures that they'll be in SB5 I think. They were quite lascivious about Yukimura and Nagamasa putting their bare thighs on show too, but I don't think either of them would be quite as annoyed about the way it was said as Naotora. Poor girl, she can't ever catch a break. Yeah, it's always unfortunate when a character who would definitely react negatively to such a lascivious phrase has it, well, said about them. Same with poor Kasuga. Mitsuhide and Tenkai may not be my favorite character(s), but gosh his voice is amazing. @_@ So definitely. Hi! Thanks for all the news again. Was happy to hear about Nohime and Ranmaru. 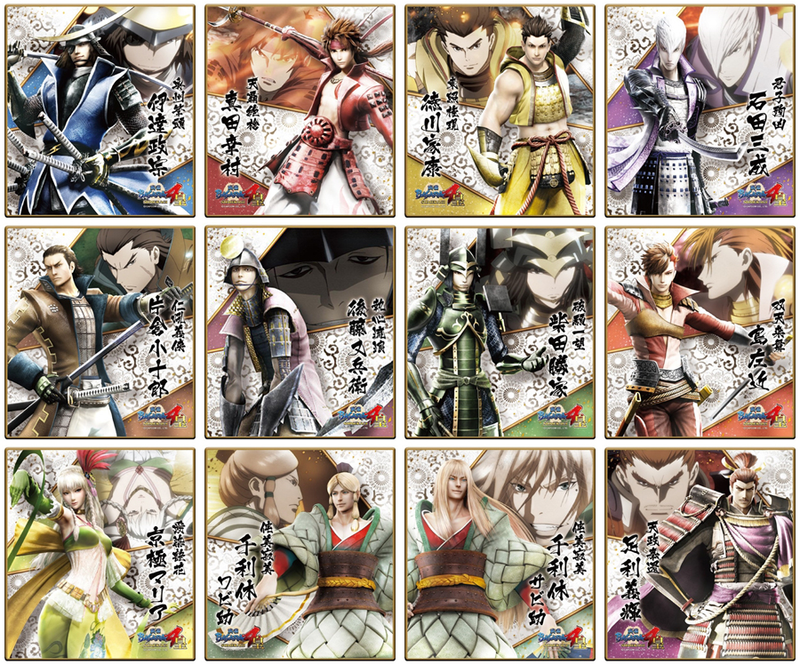 Really hope to see them in Basara 5. Well, was really happy for the Zestiria, Resident Evil and wrestilng costumes. All I can think is that they decided on the TMR costume then wanted something more 'normal' for Ieyasu too in case his fans weren't satisfied with a funny costume. Naotora getting two while some of the other girls got nothing is unfair, though... I guess her weapon and fighting style made it easier to pay tribute to other games. I'm still hoping there will be some DLC after release with even more costumes and content for the rest of the cast. Tokugawa generals getting extra costumes? It's odd and I don't mind, but Mitsunari's going crazy right now. I can definitely settle for Matabei's costume here, though. I was really hoping they wouldn't pass up a perfect opportunity to dress him up as a dinosaur, and I got what I wanted. So good to see them back in the story as players. Mm I fear you may be waiting a while for a cool, serious Naotora story and more Tenkai - though I'd be happy to see both! At least they seem to be hyping the new Mitsuhide story in the magazine. I want to see it do well! Yeah yeah, it won’t happen. Capcom wants Naotora to be comedy manhater. A pity since I’ve had a soft spot for her since I first saw her cg art. I’m interested in what will happen in that Oda story. 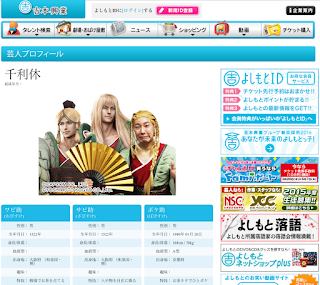 Looks like Katsuie will appear together with Nouhime and Ranmaru for the first time other than that anime scene.